The Child Support Enforcement Program was established in 1975 under Title IV-D of the Social Security Act, to help state and local agencies locate absent parents and to collect child support from parents legally obligated to pay. Child support obligations are renewable from month to month. Although each monthly payment satisfies that month’s obligation, the next month immediately begins a new obligation, to be satisfied by the next payment. The entire support obligation is not considered satisfied until the child reaches the age of majority or emancipation, or the statute of limitations for that state has been reached. Report full file on a monthly basis. Report the complete name, social security number, date of birth, and address of the obligor. Report the telephone number, when available. An acceptable reason for deleting accounts is when Child Support cases are withdrawn by the courts. All parties reporting credit information must comply with the Fair Credit Reporting Act and any applicable state laws. All parties reporting credit information must respond to consumer inquiries. Quick Reference: While all applicable fields within the Metro 2® Format should be reported, these guidelines provide specific values that apply to Child Support Agencies’ accounts. Status 11 Reported for all open, current accounts, and for cases that have been brought current. Use this status when the child, or youngest child (in the case of multiple children), has not yet reached the age of majority or emancipation, or the statute of limitations for judgments in that state has not been reached. Status 13(1) Reported when the Office of Child Support Enforcement rates this case “satisfied.” Use this status when the child, or youngest child (in the case of multiple children), has reached the age of majority or emancipation, or the statute of limitations for judgments in that state has been reached. Status 62 Reported when the Office of Child Support Enforcement rates this case as “satisfied” and the account was previously a collection. Use this status when the child, or youngest child (in the case of multiple children), has reached the age of majority or emancipation, or the statute of limitations for judgments in that state has been reached. Statuses 71, 78, 80, 82–84(2) Reported to reflect the appropriate stage of delinquency (30 days to 180 or more days past the due date). Status 93(2) Reported when the Office of Child Support Enforcement rates this case as in collections. Status DA Reported when a Child Support case is withdrawn by the courts. The action taken by the consumer reporting agencies is to delete the account from their files. 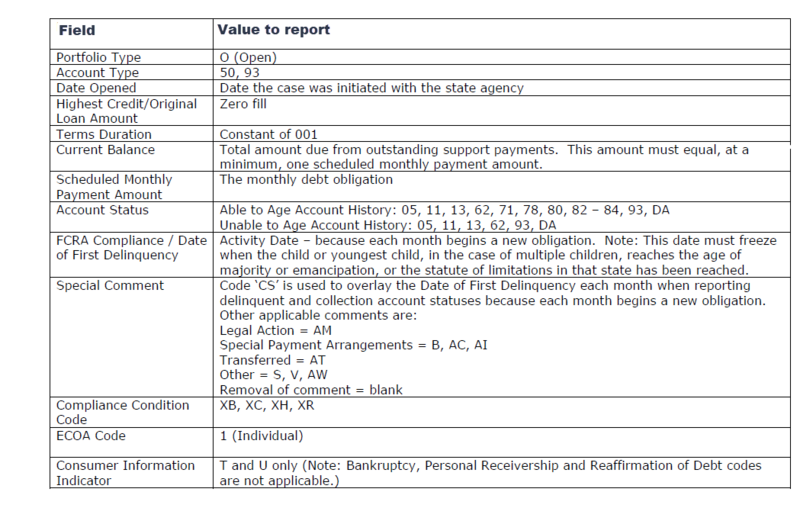 Status 05(1) Reported when the child support case is transferred to another state because of the relocation of the obligor. This usually occurs with a URESA (Uniform Reciprocal Enforcement Support Act) account. The state agency is responsible for notifying another agency when the account is being transferred to their jurisdiction. Report the Payment History Profile, which provides up to 24 months of payment history, in order for the agency to control and maintain the payment history. (1) When the Account Status is 05 or 13, the Payment Rating must also be reported. (2) When Status 71, 78, 80, 82-84 or 93 is reported, the account should be reported with a Special Comment “CS” each month in order to overlay the date of first delinquency. Special Comment “CS” is reported only until the child or youngest child reaches the age of majority or emancipation, or the statute of limitations for judgments in that state has been reached. Status 13(1) Reported when the Office of Child Support Enforcement rates this case “satisfied” and the account was previously reported as current. Use this status when the child, or youngest child (in the case of multiple children), has reached the age of majority or emancipation, or the statute of limitations for judgments in that state has been reached. Status 62 Reported when the Office of Child Support Enforcement rates this case “satisfied” and the account was previously a collection. Use this status when the child, or youngest child (in the case of multiple children), has reached the age of majority or emancipation, or the statute of limitations for judgments in that state has been reached. Status 93 Reported when the Office of Child Support Enforcement rates this case as in collections. If a Status 93 is reported, the account should be reported with a Special Comment “CS” each month in order to overlay the date of first delinquency. Special Comment “CS” is reported only until the child or youngest child reaches the age of majority or emancipation, or the statute of limitations for judgments in that state has been reached. Status 05(1) Reported when the child support case is transferred to another state because of the relocation of the obligor. This usually occurs with a URESA (Uniform Reciprocal Enforcement Support Act) account. The state agency is responsible for notifying another agency when the account is being transferred to their jurisdiction. 8. Special Comment Codes - Any Special Comment Code can be reported on accounts that do not require Special Comment Code CS. 9. Compliance Condition Codes - Report Compliance Condition Codes in conjunction with Account Status Codes and Payment Ratings when required for legal compliance. Refer to Exhibit 8 in the Metro 2® Format for descriptions of Compliance Condition Codes. 10. Current Balance - the total amount due from outstanding support payments. This amount must equal, at a minimum, one Scheduled Monthly Payment Amount. 12. Date of First Delinquency - Date of First Delinquency must freeze when the child, or youngest child (in the case of multiple children), reaches the age of majority or emancipation, or the statute of limitations for judgments in that state has been reached. U (Consumer Now Located) when appropriate. Note: Refer to FAQ 23 for guidelines on reporting an account when a consumer files bankruptcy, but the child support obligation is not included in the bankruptcy.